Since 1893, visitors to the Stanserhorn ride in the wooden wagons of the vintage funicular to the intermediate station Kälti, where they continue their ride up the Stanserhorn by transferring to the modern Cabrio Cable Car. The double-decker cable car has two cabins and an open upper deck. It is an experience for all senses, for one enjoys not only the panoramic view, but also the wind in one’s hair and the pristine mountain air. The two cabins move on side-mounted support cables in order to facilitate an unimpeded panoramic view. 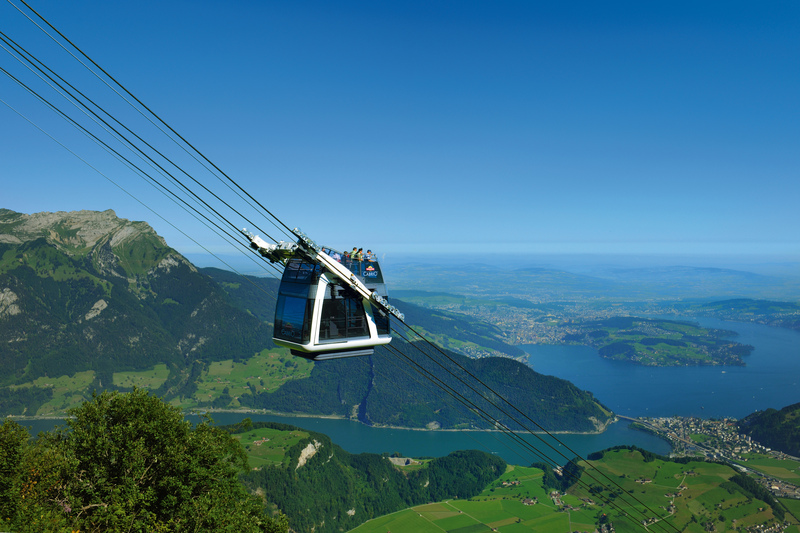 The cable car moves almost noiselessly from 711 meters above sea level to the 1850-meter high Stanserhorn. The most convenient spots to enjoy the panorama are in the revolving restaurant or on the viewing platform. Visitors who prefer more intense physical activities, hike the Flower Reserve or the Marmot Park. By the way, the Stanserhorn, an ideal summer mountain, is the local mountain of Delta Club Stans, the largest and oldest kite flying club of Switzerland - a fact that can hardly be overlooked on sunny weekends. By the way, rangers help out in naming mountain peaks. Open from 13 April to 17 November 2019. The funicular railway and the cable car runs every 30 minutes, in the event of larger groups, every 10 minutes.